The SSF Emulator, IMO, is the finest Sega Saturn emulator to date. It has great compatability, and on modern systems runs games near or at 100% full speed with sound. The big downside to this emu, though, is that it does not support CD images, but only actual game discs (or images via Daemon Tools). 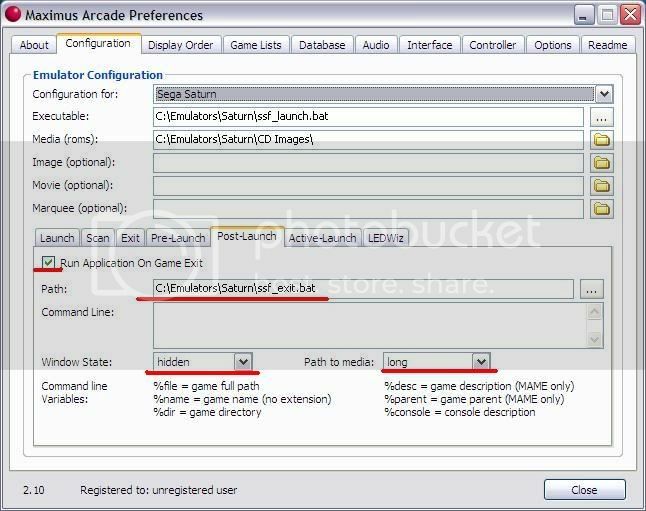 This makes setting up SSF as the Saturn emulator within Maximus Arcade such a pain in the @$$. Instead of loading CD images, SSF will launch, and immediately crash. Headrush69, another member of the forum with the same problem, discovered the cause of the error. Remember that SSF does not support ISO or BIN/CUE images of any kind, which is of course what makes virtual drive applications such as Daemon Tools a necessity for getting this emulator to run images. Because of this, SSF does not understand commands that ask for ROM images to be loaded. Whether an image is mounted using Debian or not, SSF will successfully initialize. This time, you'll receive the same CZIP error we've all been getting, this being because this is the syntax used by MA when launching the emulator. SSF has no idea how to complete this command, and simply crashes. 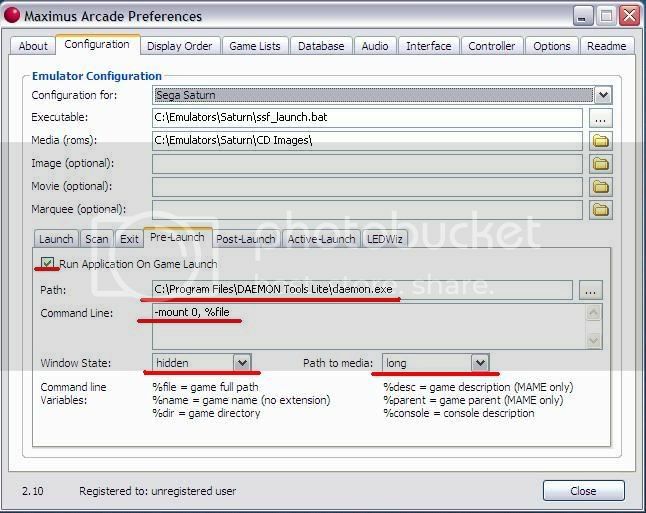 We need to trick SSF and Maximus Arcade into not attempting to load the emulator and the CD image in one command. To do this, we'll employ the use of simple batch files. *Of course, you'll need to modify my examples with the directories you've created for your emulators and DAEMON Tools installations. it assigns it a 0. If you have more then you will have 0, 1, 2 etc. You must enter the the right number virtual device that matches the drive you have selected above. 4. Now we need to be able to quit SSF with out Hot Keys and unmount our virtual device upon exiting back to the MA frontend. Normally, this would simply require us to use the "-unmount 0" Daemon command within Post-Launch. I discovered during troubleshooting that, while the Hot Keys attempt to exit SSF and will unmount the CD image, SSF continues to run regardless, and requires you to use the ESC key to return to MA. Not cool. Instead, configure the Post-Launch tab to run the "ssf_exit.bat" batch file created earlier. This way, your image will be unmounted and SSF will be terminated if you use your Hot Keys, returning you to the MA frontend safely. That's it! Save your settings, Launch MA, and see for yourself. The emulator takes a small while to launch, but eventually you'll see that glorious Sega Saturn splash screen, and your game will load. Please let me know of your results. Thanks, and good luck! Re: SSF (Sega Saturn) and Maximus Arcade! I must add there was another solution involving using the SSFwrapper someone wrote. I believe that's the solution I used for my cab, so if anyone needs it, I'm sure I can upload it for them. I remember playing with both solutions and cant remember off the top of my head which one I ended up using. That would be great if you could do that, I used the .bat solution but it's a pretty messy work around and easy to mess up. Did you have a chanced to upload the sega saturn wrapper? Sorry, I was messing around on the file repository and having little luck uploading stuff last night, so I didn't get around to looking at my SSF wrapper. I'll look into it this weekend. I too would love to try a SSF wrapper for Maximus Arcade. 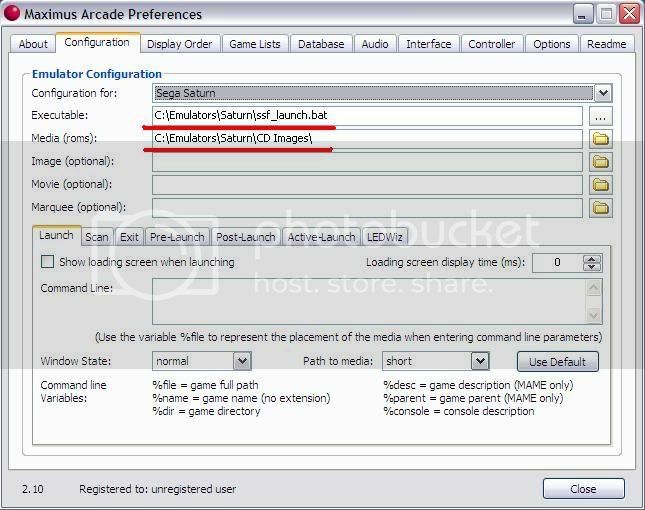 I have been using Yabuse for sega saturn emulation like maximus arcade suggests but it has not been too friendly to me and like you said SSF is probably the best saturn emulator out there. Thanks for the guide and good luck with the upload. The wrapper I was working on to get rid of the popups when you start and exit the SSF emulator in MA is finished. Its working great on my machine - load a game and nothing but black until the emulator is fullscreen and running. It was accomplished with judicious usage of the START & TASKKILL commands in batch (much like your AldousHxlE's) and the creation of an executable which displayed a large black screen which is 'Always on Top'. Performs a workaround to stop the emulator crashing out with the CZIPDecoder and CFile Errors. Mounts the selected game in Daemon Tools before starting the emulator and unmounts it upon exit. Hides the SSF menubar which displays on startup before it changes to fullscreen. Hides Daemon Tools' popup mounting/unmounting messages. Hides batch file/cmd window when performing SSF error workaround. Hides the menu/emulator window that shows briefly when exiting the emulator. Allows the exiting off the emulator with the MA Exit Emulator button. Using windows 7 64bit and the wrapper isn't working for me. It's coming up with a dos window telling me that sleep doesn't work then everything is being shown and the game starts in a window not full screen. How do I fix this? If I remember right (again it's been a while since I set it up on my machine), I had the same problem and it was a simple fix. If I remember right I did a google search on the error and it was a common problem that required a windows patch. I'm running windows XP, but I think there was a patch for Windows that fixed it for me. Again, I could be way off, it was a long time ago that I set mine up, but I kinda remember that. Try that out, hopefully it works. Thanks for the push in right direction. I downloaded the toolkit and found that I needed to change 0 to 1 for full screen in the .ini. It's working great now. It still comes up with a small window while loading but I can live with that. Now to figure out why daemon tools will only work with the mounted .iso and why it doesn't work auto. Any suggestions? I've done it! I needed to edit the path to daemon tools so that it read 'program files(x86)' before the daemon tools path due to the fact that it installs to the x86 version of program files. Me, being new to 64bit, didn't realise that. Oh well, it's all a learning curve and I'm enjoying every minute of it. Don't think my girlfriend is so much though. Apparently I should have a relationship with my computer seeing as I give it more attention than her. I have my games launching correctly, I just can't get the image to unmount when I exit. The ssf_exit.bat works to unmount disks outside of MA, but when I point MA to Post-Launch it, it seems to just not run. I am exiting games using the Quit Executable shortcut. Any suggestions? ?